Apple software can get quirky when dealing with other products. If you’ve ever tried to convert your mails from OLM to MBOX (Outlook on Mac) into another client, you’ve probably found that out already. If you haven’t, you’ll probably be giving us the weird look. It should be an easy process, right? — wrong. 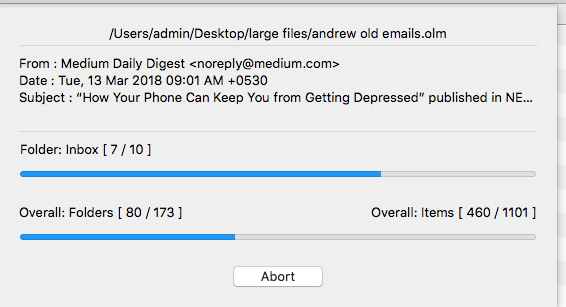 Exporting your emails from Outlook on Mac will create a number of .olm files which you’ll probably have no idea what to do with. If you can’t import the info OLM to Apple Mail or into another clients, what are they good for? Now another question that pops up in mind is, can one import OLM in Apple Mail or how do we convert OLM to Apple Mail or any other compatible mail archive format. Quick answer: nothing. But don’t worry; we’ve got you covered. Apple Mail Supports mbox file format to import archived mail data. OLM Converter Pro can handle OLM to MBOX conversion like a Pro! OLM Converter Pro is your Mac solution for dealing with Outlook Mac, OLM to MBOX mail migration. Our product is able to seamlessly migrate your emails into Apple Mail, Thunderbird, Microsoft Entourage 2004/2008 or PostBox, all while working directly on your Mac. Migrate all your emails from Outlook for Mac to Apple Mail or Microsoft Entourage 2004/2008 within minutes while preserving your mails hierarchical structure intact. 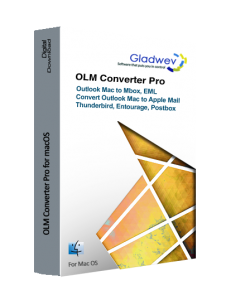 Gladwev® OLM Converter Pro is able to convert your Outlook exported emails into more versatile and standardized formats, such as MBOX and EML. Convert those files and load ‘em up anywhere you want. Sometimes, your .olm files can be scattered all over different folders. Converting them would imply gathering them all, but Gladwev OLM Converter Pro on Mac does the work for you through its batch conversion. Just Drag & Drop the OLM files and all files will be converted in a single batch. Emails come in all sizes, shapes and forms. Non-english languages and double-byte content tangle the migration between clients, but our software deals with those issues while preserving your info. Emails rarely go alone; they like to carry documents attached, which easily get lost on the migration. Gladwev OLM Converter Pro keeps all those attachments in check, leaving no room for any data loss. Nested mails are a tough call: hierarchical structure of messages and folders must be enforced to keep them tight. Our software will take care of all your nesting before you even think about it. Yeah, we know it’s a killer. But don’t take our word for it! We put a free trial for you just below, so, why don’t you check it for yourself before investing in a license? Give it a try! 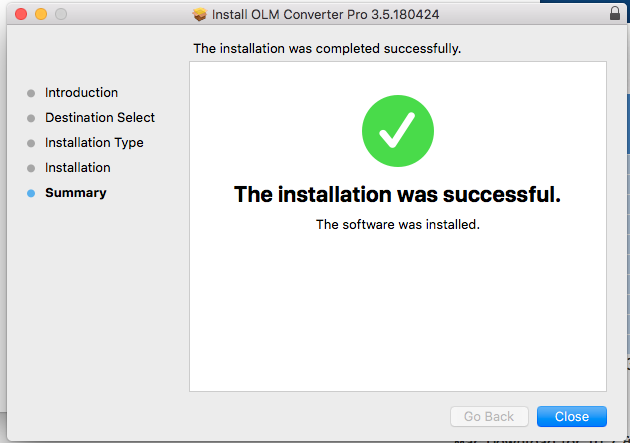 Easy Steps, How to Convert OLM to MBOX Format on Mac OS X.
Download the correct version of OLM Converter Pro. Double-click the .pkg file to install the OLM to MBOX converter. The Introduction screen opens up. The next window gives you the option to select the installation location of the OLM to MBOX Conversion tool. Click on Change Install Location to configure the right storage. 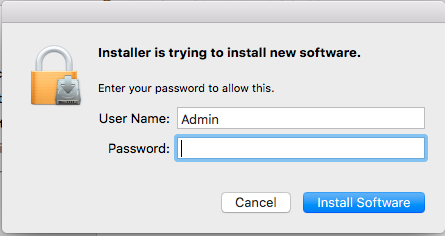 Click on Install to proceed. Search the OLM Converter Pro tool from the Spotlight. 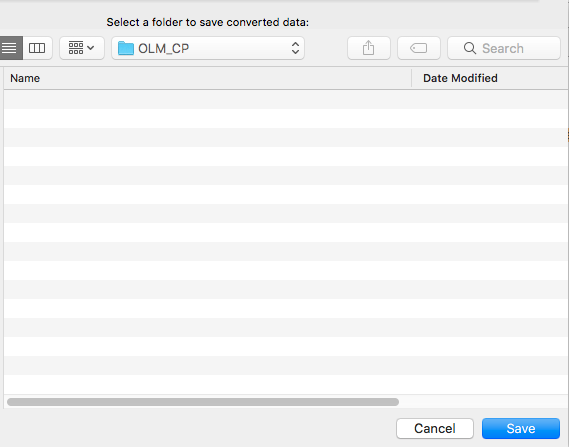 Select the OLM file to convert OLM to Mac Mail format. You can add more OLM files by clicking on “Add OLM Files”. The subfolders are shown along with the OLM files. You can deselect te files which you don’t desire to export from OLM to Mac Mail format. Ignore empty folders: You can save space and time by ignoring the conversion of empty mail folders. Just click the checkbox meant for the same. You can convert selected items by clicking the checkboxes meant for Mail/Calendar and Contacts. Select the exact file format you expect for importing your OLM files to MBOX format. Click on Start after making the right arrangements. Here we have chosen Apple Mail to Import OLM files to Apple Mail format. A pop up window asks to take a free run or purchase the License. With the free trial you can Export up to 10 OLM mails to MBOX. Select the location where the OLM to Mac Mail exported data needs to be stored. Click on Save. Wait til the OLM to Mac Mail Conversion completes. You can abort the conversion any time. Report shows up a brief description of all the converted data. Click on Locate Output folder to find all the converted files from OLM to Mac Mail format. 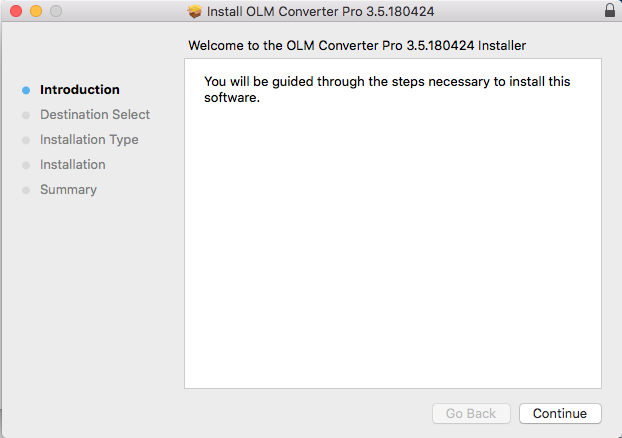 What are the limitations of OLM Converter Pro Trial Version ? It’s a fully functional copy of the app and lets you experience the OLM to MBOX conversion process first hand. Only limitation is while exporting the converted data, the app exports only 10 mails each folder while using Trial version of our App. I am a Outlook Mac user on Mac, will the conversion process be completed on my Mac? 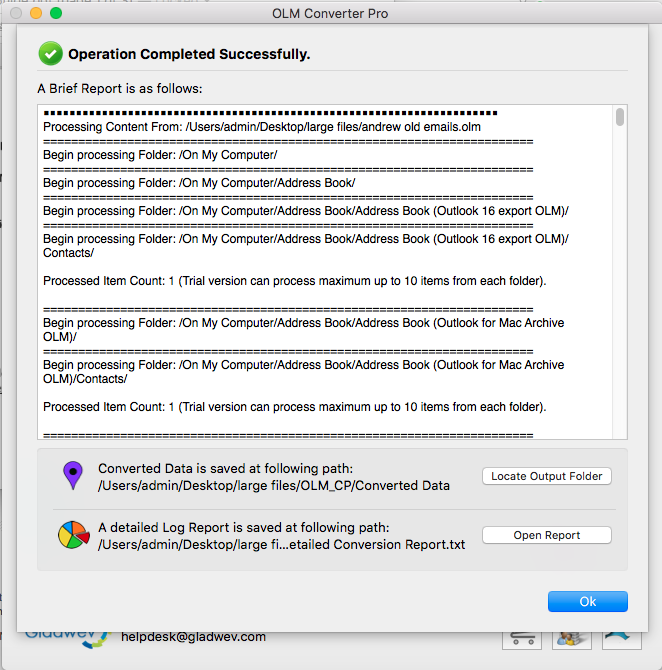 Gladwev OLM Converter Pro is the only app that works directly on Mac. You can export the .olm archive file from Outlook Mac and add those for conversion . You can import the output file in mail client of your choice be it Apple Mail, Entourage, Mozilla Thunderbird and you are all set to use the new Mail Client this moment forward. Do I need to Wait for the Physical product to be shipped to start with olm to mbox conversion process ? No, not at all, our software is a Digital Download as we care for mother earth, the software can be downloaded instantly. You will receive a License key on your email address specified while placing the order with in 15 minutes. You are all set to proceed with conversion, after Activating your OLM file Converter license. Can I export a olm file to apple mail ? It is not possible to import a olm file to Apple Mail, As apple mail is not capable of reading olm files from Outlook Mac. 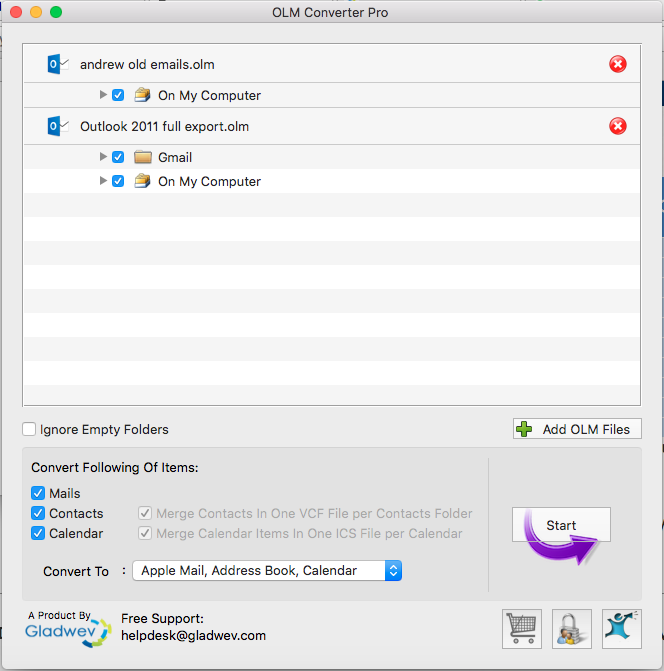 However, you may use a OLM to Apple mail converter like OLM Converter Pro by Gladwev to convert olm file to mbox, which can be read and imported in Apple Mail. What is the possible solution to import OLM to Mac Mail ? 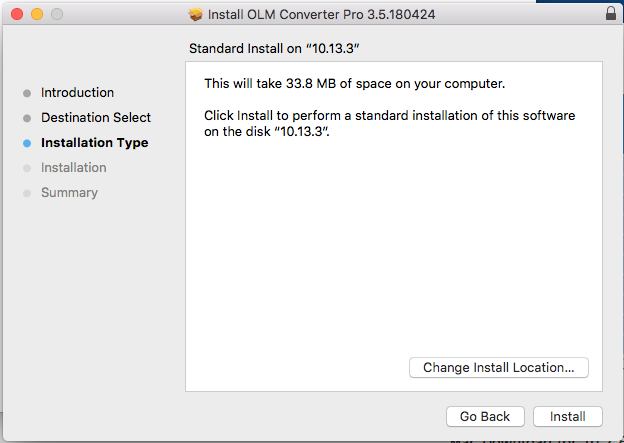 Does Outlook Mac lets you export OLM for Mac Mail import ? The only possible solution for importing olm mails to Mac Mail is to Convert OLM to MBOX file first and import mbox file to Mac Mail to get all mails from Outlook Mac archive in Mac Mail. Why is OLM to Mbox Converter not a Free Utility? We put a lot of effort on ensuring your mail data is converted with perfection and release regular updated keeping up with macOS updates from Apple. It requires a lot of effort on our part. We keep the software cost nominal, so every one can afford it. Not to mention the cherry on top, we provide free premium OLM to Mbox Conversion Support. We just put a free trial, so, why don’t you check it for yourself? Why don’t you check it? Give it a go! At Gladwev®, we have spent the last decade in research & development of solutions which specialise and simplify migrating, recovering emails between different softwares and Operating Systems. Our clients just love us for the simplicity and excellent support we offer when it comes to any problems with E-mails. © Copyright 2011 - 2017 Gladwev® Software Pvt. Ltd. All rights reserved. All Trademarks Acknowledged.